This day, dear ones bid a formal farewell to a loving man, who stepped up as an extra dad when I desperately needed a good one. All these years, it’s been great comfort knowing his solid, practical self puttered about the home place, and a visit ensured his “Hello, daughter!“ greeting. Now memory must deliver his wisdom and (often corny) humour - but what a treasure trove he left in the minds and hearts of family and friends. On days like this, I look to the sky. 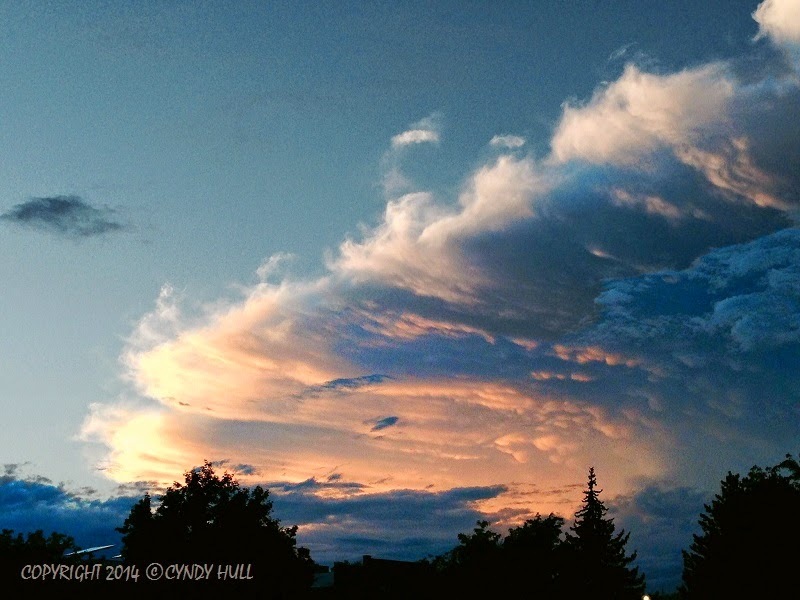 I like to think of fabulous clouds as heaven’s front yard landscaping, setting the stage to welcome travelers home. I know, I know, maybe the literal location isn’t just a hop, skip, or jump beyond the firmament we see. But since I haven’t been there yet, I just don’t know; and it could be, so dive with me into that fanciful thought. You are dearly missed, Dad, and we can’t even realize yet how much. Happy trails, until we meet again. In salute to your genuine cowboy self, here’s a horsey landscape quote that I think you’d like, from one of my favourite western genre authors. Hugs received - thank you! It was a beautiful service, alternating laughter and wistful tears, with procession via horse-drawn wagon and accompanying riders; one rider led Chuck's riderless Appy, hat on saddle horn, boots in stirrup backwards. Oh Cyndy, this post touched me and, yes, made Kathleen and I both cry. He always did think of you as one of his own and never failed to ask me how you were and if you still had that happy giggle. Well, that made three of us crying, for sure! Sweeter words never heard than, "Hello, Daughter!". All these years, I've been so blessed to be included by your family, and I count it a delightful privilege.